Several campaign finance bills could move quickly through the Legislature before the end of the year. Michigan flags to be lowered in honor of former President George H.W. Bush. Western Michigan will face Brigham Young in a post-season college bowl game. (MPRN) Lawmakers are moving quickly to try and pass several campaign finance bills through the legislature during the lame duck session. One bill, currently in the house, would prohibit any public agency from requiring nonprofits disclose their financial supporters. 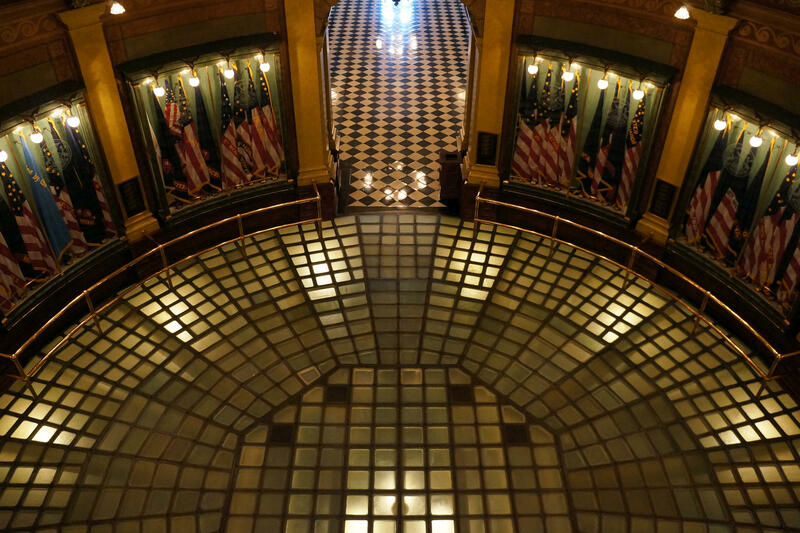 Craig Mauger with the Michigan Campaign Finance Network says nonprofits currently are not required to report who supports them, so it’s likely a preventative measure intended to tie the hands of the incoming administration. Bill supporters say the legislation would protect donors to nonprofit groups like Planned Parenthood who don’t want to get harassed. Governor Rick Snyder has ordered flags lowered to half-staff for 30 days to honor former President George H.W. Bush who died Friday night. In his statement, Snyder calls the 41st president a great person who served his nation not only in the military and as President, but as a role model for us all.” Flags at state facilities will flown at half-staff. Michigan residents, businesses, local governments and other organizations are also encouraged to lower their flags in honor of George H-W Bush. Snyder’s order says flags should be returned to full-staff on December 30th. (WDET) A University of Michigan economist says many signs point to a coming recession. But researchers predict the economic downturn is likely years away. The nation’s economy has expanded for almost a decade and experts say it will have to contract at some point. But University of Michigan researcher Donald Grimes says despite a weakening housing market and auto industry both the U.S. and state economy are now strong enough to avoid a major meltdown. Grimes says Michigan remains tied to the fortunes of the auto industry but he says the financial markets have strengthened significantly since the so-called Great Recession between 2007 and 2010 and should be able to avoid a similar kind of collapse. Western Michigan will face Brigham Young in the Famous Idaho Potato Bowl December 21st in Boise. Bowl games for college football’s post season were announced Sunday. The Broncos finished the season 7-5 and 5-3 in the Mid-American Conference. BYU from the Mountain West Conference was 6-6 in the regular season. Western is playing in a post-season bowl game for the fourth time in five years.